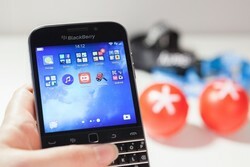 Smartphone manufacturer Blackberry has been granted a US patent on a method for detecting whether a battery used in an electronic device is counterfeit or defective. "Counterfeit batteries pose a significant concern to manufacturers or sellers of portable electronic devices," says the patent, which notes that while consumers often buy these because of their low cost, they carry significant risks thanks to the omission of safety features. Fake batteries have caused devices to be damaged and - in some extreme cases - have also been linked to fires that can place the properties and lives of users at risk. The test involves measuring the parameters of a battery in use, creating a signature that the electronic device can use to differentiate a genuine item from a fake or defective unit. "If an actual battery characteristic profile is not substantially similar to its corresponding expected battery characteristic profile, then the device determines that the battery is either counterfeit or defective and takes the appropriate action (e.g. notifies the user), it notes. Abstract: Systems and methods are disclosed for detecting whether a battery in an electronic device is counterfeit or defective. An actual battery characteristic profile is generated by recording the performance of the battery during use of the battery by the device. This profile is then compared to its corresponding expected characteristic profile. If the profiles are not substantially similar (i.e. if the error between the two curves exceeds a given error threshold), the battery is determined to be counterfeit or defective and responsive action is taken.